Food is more than something to sustain, it can be intrinsically linked with stories throughout your life. That is what runs through the centre of Nigel Slater’s Toast. 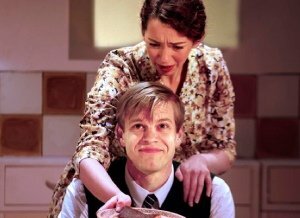 Nigel, played by Giles Cooper, starting as a 9-year-old boy helps his mum, played by Lizzie Muncey, to bake in their kitchen. Fueled by the toast she makes for him, it is after all “impossible to not love someone who makes toast for you” he tells us, even the always charred kind his mum gives him. Nigel switches between acting the memories of his childhood, that are all influenced for him by food, stepping out of the scene and narrating to the audience. The recited recipes and half-remembered events, corrected by his mum when Nigel’s version doesn’t actually reflect what happened, lead all too quickly to Nigel’s mother dying. Food and pain, the staple of Nigel’s childhood carry on as Nigel’s dad, played by Stephen Ventura, introduces Nigel to “aunt” Joan, played by Marie Lawrence who quickly becomes his stepmother. From Nigel’s point of view that would be an evil stepmother who makes his life hell. Lemon meringue isn’t just a dessert it is a weapon to be wielded against young Nigel by the evil stepmother proving her superiority in the kitchen. Nigel isn’t deterred and cooking becomes his life when he gets a job in a local kitchen. You will be taken on a nostalgic journey through childhood sweets, smells and with the audience being given the chance to taste certain delights given out during the performance. The smells of onstage cooking drift over the audience, and it does smell nice, towards the end of the play. All actors give commendable performances and the choreographed pieces of movement are great to watch. Special mention must be given to Cooper’s warm and engaging performance as Nigel, as he is barely off stage and the whole play is built around Nigel. Nigel Slater’s Toast is a new play based on his award-winning autobiography. Vividly recreating suburban England in the 1960s, Nigel Slater’s childhood is told through the tastes and smells he grew up with. From making the perfect sherry trifle, waging war over cakes through to the playground politics of sweets and the rigid rules of restaurant dining, this is a moving and evocative tale of love, loss and… toast.